Rare Colorado Stock Certificate. 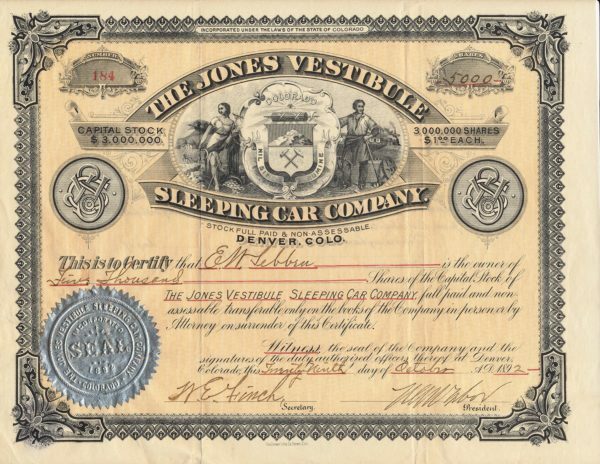 The Jones Vestibule Sleeping Car Company, with Horace Tabor’s signature, signed as President. Horace Austin Warner Tabor, (Nov. 26, 1830 – April 10, 1899) also known as the Silver King in the mining towns of Colorado, was an American prospector, businessman, and politician. From a simple stone cutter he grew to be one of the countries wealthiest man, only to loose it all living a extravagant lifestyle and making pure investment decisions in the last years of his life. The Jones Vestibule “Palace” Sleeping Car was proudly displayed at the 1892 Worlds Fair. The stock was advertised as “The Best Buy” and one which will make you money quickly.